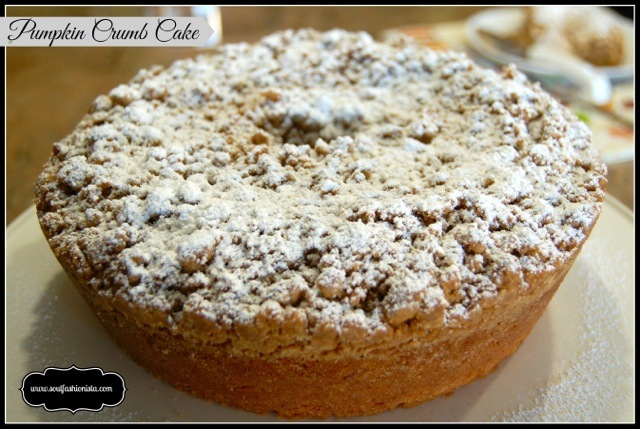 Two years ago I sank my teeth into the most amazing piece of heaven called a Pumpkin Crumb Cake. 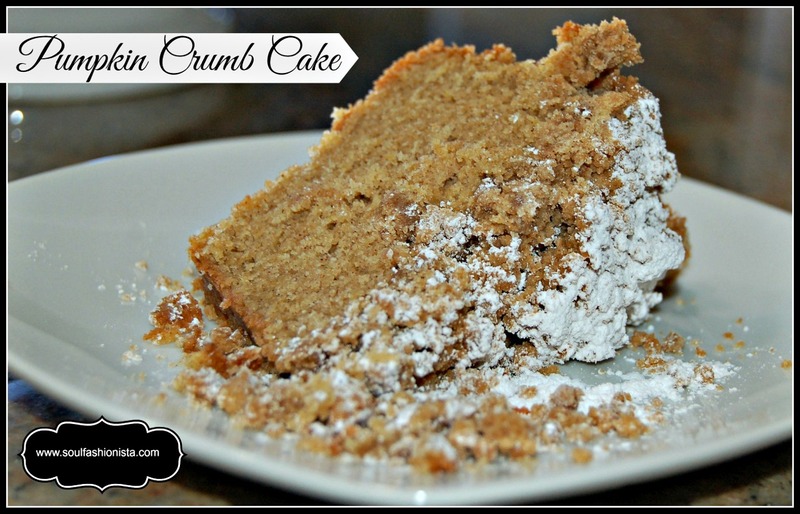 It was unlike any other crumb cake I had ever tasted. They sell the most amazing coffee and also a fabulous Pumpkin Crumb Cake. After my discovery, I found myself leaving the conference I was attending just to go for coffee, paired with that incredibly, scrumptious cake of course! Even though I usually try to stay clear of flour and sugar, I could not stay away from this place. On the way home, I called my daughter, Ana-Lisa, to tell her about my finding and that I was bringing her a surprise. Well that little surprise never made it home. 🙁 She knew I had eaten it too; hence the powdered sugar all over my blouse. So, to satisfy my conscience, I promised to make her one that was just as delicious. 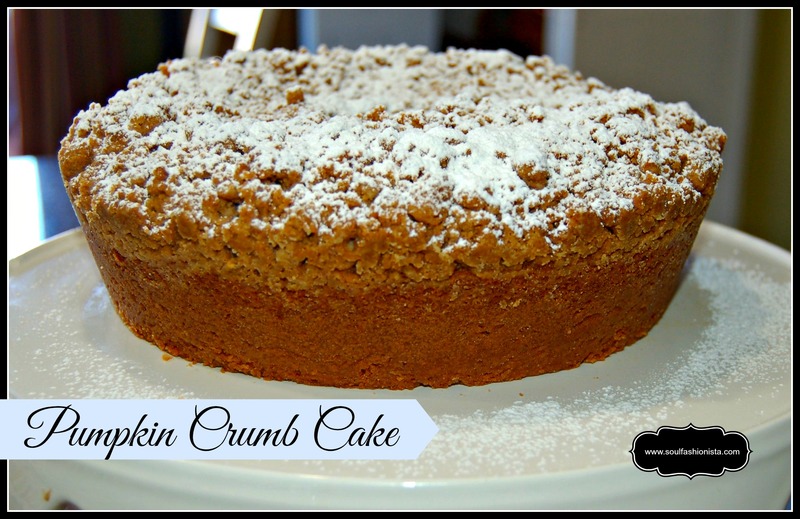 That is when my quest for this Pumpkin Crumb Cake recipe began. After much searching, I wasn’t able to find a recipe that I loved. Since most recipes do not contain ingredients that are entirely from scratch, I had to experiment to come up with something of my own. It is still not identical to my inspiration but it turned out awesome and everyone who tries it agrees. I will definitely be making it for Thanksgiving. One of the beautiful things about this recipe is that it allows you to make adjustments. If you want more or less of the pumpkin taste, you can adjust the ratio of sour cream to pumpkin. You can also adjust the crumb topping consistency. Please indulge and let me know what you think. Note: My daughter likes it with less pumpkin therefore I use ½ cup sour cream and ½ cup pumpkin. You can adjust to your preference, as long as the two ingredients equal 1 cup. In a large bowl, sift together flour, baking powder, baking soda, cinnamon, spice, salt and nutmeg. Set aside. Add eggs one at a time. Mix until well incorporated. Stir in the bowl of dry ingredients until well-blended. Pour batter into prepared pan and distribute evenly. Add crumb topping. Push down slightly. Bake in the center of oven until inserted toothpick comes out clean. Transfer to wire rack to cool. Make sure crumb layer sets on top. Once cake is completely cool, sprinkle with powdered sugar and indulge.